CLIP-Vista Green is a green fluorescent substrate that can be used to label CLIP-tag™ fusion proteins (in cell lysates or purified proteins) for detection by SDS-PAGE. 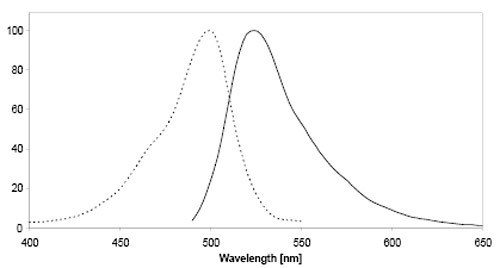 This substrate (BC-Vista Green) is based on fluorescein and is optimized for excitation with the 488 nm laser excitation line in a laser based gel scanner. It can also be excited using 360 nm light from a standard UV-transilluminator. It has an excitation maximum at 500 nm and emission maxima at 524 nm. This package includes 50 nmol of CLIP-Vista Green substrate, sufficient to label one hundred 20 µl samples containing CLIP-tag fusion protein for in-gel detection. The CLIP-tag™ protein labeling system enables the specific, covalent attachment of virtually any molecule to a protein of interest. CLIP-tag is a protein tag based on human O6-alkylguanine-DNA-alkyltransferase (hAGT). CLIP-tag substrates are derivatives of benzylcytosine (BC). In the labeling reaction, the substituted benzyl group of the substrate is covalently attached to the reactive cysteine of CLIP-tag forming a stable thioether bond. Although CLIP-tag is based on the same protein as SNAP-tag, the benzylcytosine substrates form a separate class of substrates, different from the benzylcytosine substrates form a separate class of substrates, different from the benzylguanine substrates recognized by SNAP-tag. CLIP-tag and SNAP-tag® can be used for orthogonal and complementary labeling of two proteins simultaneously in the same cells. There are two steps to using this system: subcloning and expression of the protein of interest as a CLIP-tag fusion, and labeling of the fusion with the CLIP-tag substrate of choice. Expression of CLIP-tag fusion proteins is described in the documentation supplied with CLIP-tag plasmids. The labeling of the fusion proteins with the CLIP-tag substrate for detection by SDS-PAGE is described in this document. Typical SDS-PAGE of CLIP-Vista Green labeled proteins visualized using a gel scanner. The gel was imaged with a Typhoon 9400 imager at 300V PMT with the 488/526 nm excitation/emission filter set. Storage: Store substrate at -20°C. After dissolving CLIP-Vista Green store it in aliquots at -20°C in the dark for up to three months. Once an aliquot is thawed it can be stored at 4°C in the dark for up to two weeks. Make sure substrate, which may precipitate during freezing, is completely dissolved before use. With proper storage at -20°C, the substrate should be stable for at least three years dry, or three months dissolved in DMSO.